The SpeckGRABBER® removes individual particles of dust and dirt from sensitive surfaces without damaging them or leaving any residues on them. It therefore has a tip with high adhesive strength, which is brought into contact with the particles. This technique is used for removing particles of dirt from camera sensors (respectively their glass covers), SRL mirrors, objectives and oculars, as well as films, slides, the glass from picture frames or other sensitive surfaces. SpeckGRABBER® Pro with rubber-coated handle. 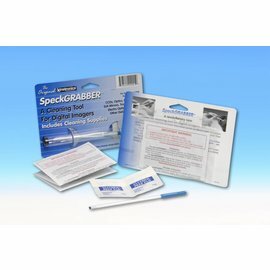 SpeckGRABBER® Pro kit with SpeckGRABBER Pro handle, three tips, cleaning solution and Panther antistatic cloth in robust box. 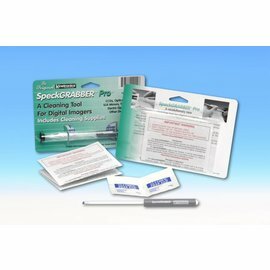 SpeckGRABBER® Pro-Kit, handle with integrated mini lamp, battery, three tips, cleaning solution and Panther anti-static cloth in robust box. 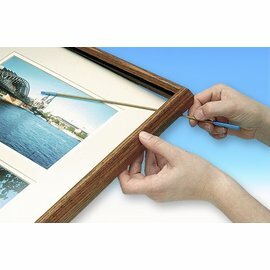 SpeckGRABBER® XL for removing particles of dirt from framed pictures, 298 mm long, 2 pieces. 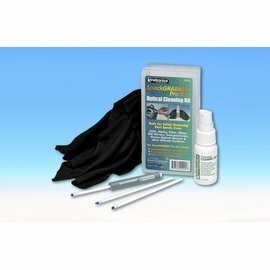 SpeckGRABBER® XL with two SpeckGRABBER XLs, cleaning solution and Panther antistatic cloth.